A candid self-help book about forming bonds with adopted children. Guerra (Upside Down, 2014) uses a pragmatic, straightforward voice to address the challenges that stem from attachment issues with adopted kids. She’s an adoptive mother herself, and a key aspect of her approach—limiting kids’ interactions with outside adults—seems counterintuitive, she says, and it’s often not understood by those outside adoptive families. Due to past traumas, adopted kids often experience confusion about whom they can trust, the author says, and they often have difficulty attaching to their new parents. As a result, they can develop manipulative behaviors in an attempt to feel in control. Interactions with well-meaning adults can then lead to setbacks—troublesome behaviors that can last for weeks. The book illustrates its central concept with many examples from Guerra’s and other adoptive family members’ own lives. It also talks through the sometimes-trying realities of life in an adoptive family, contrasting them with “rose-tinted” fictional portrayals of the experience. The author establishes why limits are necessary, how to recognize and respond to difficult behaviors, how to deal with judgmental members of the larger community, and how others can help. The author’s many references to Christianity underscore how her faith has been an integral part of her parenting experience. The book might have benefited from early, precise definitions of what the author describes as “the entire spectrum ranging from general attachment issues to Reactive Attachment Disorder,” to assist the uninitiated. That said, she does helpfully include information on further resources and is adept at illustrating ideas with metaphors. For example, in the second chapter, Guerra uses the metaphor of a plaster cast, noting that “the broken child is set into their family for healing and protection,” and “their sharp edges must be treated with care.” Perhaps most importantly, this book reminds adoptive parents that it is acceptable, and even expected, to be imperfect and sometimes overwhelmed. 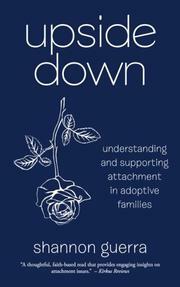 A thoughtful, faith-based read that provides engaging insights on attachment issues.